If the Rockpools on the van were sectionals, they'd be inside the van! The boats on the beach are a Rockpool Alaw Bach and a Valley Nordkapp (far). There are only a few kayak manufacturers that make sectional sea kayaks, and they are typically special order for an upcharge of $800-$1200 US Dollars. The work that goes into making a sectional is considerable, including extra glass, double bulkheads, bolts or clips. These are the only big name sea kayaking companies that make sectionals, that I am aware. These are smaller sectional kayak makers,but I have never seen one or heard from anyone that owns one of these boats. 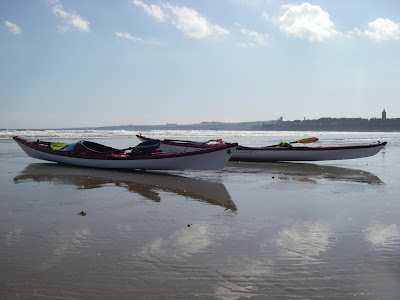 If you know of other manufacturers, or in particular own a sectional sea kayak, please do contact me. We offer all types of Hub Bolts/ Wheel Bolts, Revolving Nuts, Washers etc. We offer these in cold forming and hot forged for all 4 wheel Vehicles Truck and Trailers. Windsor is a manufacturing unit which has now grown into a multi product entity claiming to be among the best quality manufacturers. We have the latest technology incorporated in the production of modern Adjustable Table Torque Rod, Main Bracket, Equalizer Taper Bush and Equalizer in very close tolerances and committed to standards of excellence. We have complete manufacturing facilities in-house under one roof. Its really very nice and informative blog. More over i want to ask about trailer parts for our automotive industries. Nice sharing. Thanks for sharing this informative post. Super Engineers manufacture and exporting wide range of Industrial fasteners like nuts, nut and bolts, hexagon thin nuts, t-nuts, cap nuts, knurled nuts, pipe nuts, pins. threaded bars, washers, disc washers, nuts, cap nuts,pipe nuts and many more at best industrial price. For more information visit the site once.